ADDIS ABABA- Ninety-year-old Zimbabwe President Robert Mugabe, one of Africa’s most divisive figures, ascended to the rotating chairmanship of the African Union (AU) on Friday, casting a shadow over the continental body’s relations with the West. 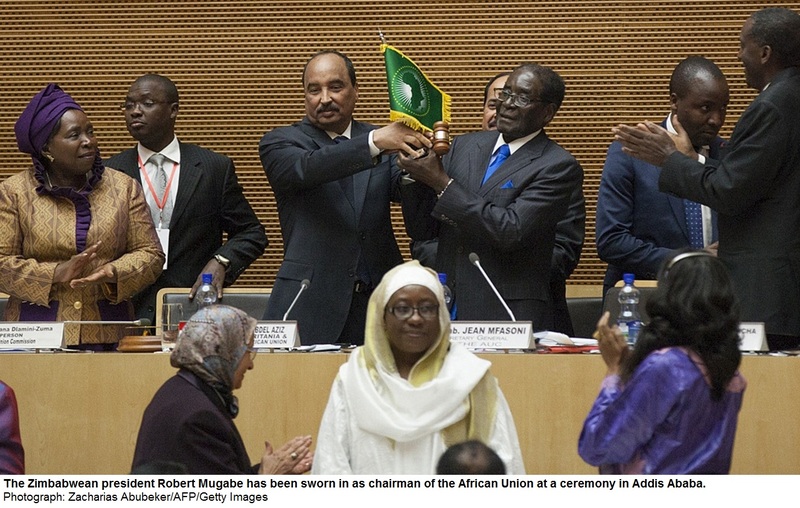 The only leader Zimbabwe has known since independence from Britain in 1980 assumed the largely ceremonial role when he was handed the AU flag and gavel at a summit in the Ethiopian capital, Addis Ababa. In his acceptance speech, Africa’s oldest head of state spoke of the need to guard against foreigners exploiting the continent’s mineral wealth and called for more assistance for African farmers. “African resources should belong to Africa and to no one else, except to those we invite as friends. Friends we shall have, yes, but imperialists and colonialists no more,” he said, to applause from his peers. In some corners, Mugabe is feted as a nationalist hero who triumphed over colonial power Britain on the battlefield and at the ballot box, and who remained steadfast in his commitment to the promotion of black African power in the 34 years since. “Zimbabwe is an important member state, a very committed country,” Algerian Foreign Minister Ramtane Lamamra told Reuters on the sidelines of the summit. It is a view shared in the European Union and United States, which imposed travel and financial sanctions on Mugabe and his acolytes after election victories over the MDC in 2002 and 2008 marred by violence and charges of vote-rigging and intimidation. Mugabe denies any wrongdoing. As AU chairman, Mugabe can influence topics for debate although other leaders and commissions also frame discussions. Piers Pigou, southern Africa director for the International Crisis Group think tank, said the continent needed to show it was improving the quality of its democracies, but that it was not only Mugabe who was likely to dodge such questions. ADDIS ABABA, Ethiopia- President Mugabe has urged Africans to sing the hymn “Africa for Africans” saying the continent’s resources should belong to Africans with foreigners coming in only as friends.Departing from his prepared acceptance speech soon after his election as Africa Union chairman yesterday, President Mugabe said God had blinded the erstwhile colonizers to some of the resources on the continent which were being discovered now and which resources should be harnessed to improve livelihoods on the continent. “Let me congratulate Equatorial Guinea for having agreed to host our soccer event (the AFCON), on taking the burden to host the event. Equatorial Guinea is a small country, we used to call it Fernando Po, and in geography we actually found it difficult to locate it on the map but now it’s big enough, we have made it big enough. “And as fortune would have it, they have discovered oil. They are not the only ones who have had this recent fortune, oil as God has provided them with oil as others also have been discovering oil, oil, oil, oil, which the blind eyes of colonialists missed. It was the handiwork of God, we thank Him. “African resources should belong to Africans and no one else. Except those we invite as friends, friends we shall have yes but imperialists and colonialists, no. Africa is for Africans, let us sing,’’ President Mugabe said to thunderous applause from delegates. Zimbabwe recently discovered diamonds in Chiadzwa, Manicaland which invited a severe backlash from the West which wanted them classified as conflict diamonds to prevent the country from benefiting; while in the case of Equatorial Guinea, the government of Mr Teodoro Obiang Nguema Mbasogo was only served from a potential coup by the timely interception of a plane-load of mercenaries by the Zimbabwe Defence Forces in 2004. President Mugabe’s comments come on the back of disturbing revelations that 60 percent of the African Union budget is donor-driven as many cash-strapped member states are failing to honour their membership subscriptions yet billions of dollars worth of semi or raw resources are exported from Africa costing the continent much-needed revenue. Add to this illegal financial outflows partly the work of multi-national corporations externalising funds to their home countries and the picture gets even more grim. To this end, former South African president Thabo Mbeki will today present a report of the United Nations Economic Commission for Africa (UNECA) High Level Panel on Illicit Financial Outflows from Africa to the Heads of State and Government Summit. The Panel, which he chairs, was established in February 2012 to investigate how Africa loses resources and to make recommendations on steps that should be taken to combat the problem. ADDIS ABABA- African leaders attending the 24th African Union (AU) summit in Addis Ababa vowed to strengthen cooperation with China to develop infrastructure and embolden the war against terrorism and infectious diseases. The 2015 African Union Heads of State and government summit ended on Saturday amid calls for concerted efforts to promote security and development on the continent. Leaders discussed women empowerment and pressing security challenges like terrorism, civil strife and the spread of Ebola in West Africa. The chairperson of the AU commission, Nkosazana Dlamini-Zuma in her keynote address said implementation of the Africa’s 2063 agenda had gathered steam. “Our aspirations and concrete programs in Agenda 2063 are very clear; to diversify our economies and industrialize, to have skills and entrepreneur revolution, unleash the creativity of youth and transform agriculture,” Dlamini-Zuma told leaders. Foreign dignitaries including UN Secretary-General Ban Ki-moon and Chinese Vice Minister for Foreign Affairs Zhang Ming attended the African leaders summit. The Chinese government and AU signed an MOU ahead of the summit to promote infrastructure development and industrialization on the continent. Dlamini-Zuma said that Sino-Africa cooperation had entered a critical phase as both parties pursue common aspirations and interests. “China will be a key partner in our noble quest for transformation through industrialization and development of modern infrastructure like high speed trains, superhighways, ports and ICT infrastructure,” Zuma said at a press briefing. The Africa’s agenda 2063 roots for socio-economic transformation through investments in physical infrastructure, skills, industrialization and agriculture transformation. AU member states are required to mobilize massive resources to implement the ambitious blue print. Political leaders and experts agreed that time was ripe for Africa to eschew over-reliance on external resources to finance development projects. Zimbabwean President and new AU chairman, Robert Mugabe said that Africa had abundant resources that should be harnessed to implement mega infrastructure projects like roads, railways and ports. He noted that China is among reliable partners who have pledged resources to aid the development of superhighways, hydropower, sub marine cables and modern ports. “China is a critical player in modernizing Africa’s economy. We have looked up to China to help us develop new highways dotting the African cities. Our bilateral trade has increased in volumes and the country is a leading source of foreign direct investment in the continent,” said Mugabe. The President of Senegal, Mackay Sall noted that South-South cooperation has benefited African countries through technology transfer and sharing of best practices to accelerate industrial growth. “China has pursued a development path that resonates with our circumstances. We need to strengthen cooperation with China to address some of our development challenges,” Sall told experts. Policy makers and experts stressed that Sino-Africa cooperation should be strengthened to combat new security threats effectively. The AU Chairpersons’ Special Representative for Counter- terrorism cooperation, Francisco Madeira told Xinhua that China has enriched the fight against extremism and violence in Africa. “We are partnering with China in many aspects to combat terrorism effectively. Our cooperation centers on training and capacity building to boost anti-terror efforts,” said Madeira. He noted that China has contributed peace keeping troops to restore stability in trouble spots like South Sudan. During an interview with Xinhua, the Liberian Foreign Minister, Augustine Kpehe Ngafuan hailed China’s contribution to the fight against Ebola in West Africa. “We received material support from China to fight Ebola when the disease was at its peak last fall. China also deployed a dedicated team of health workers to countries affected by Ebola,” Ngafuan said. African leaders have agreed to send 7,500 troops to fight the Boko Haram insurgency in north-east Nigeria as the international community, including long-time foes the US and Iran, rallied against the militants. The African Union announced the move on Saturday on the closing day of a summit of AU leaders in the Ethiopian capital, Addis Ababa. The UN secretary-general, Ban Ki-moon, earlier said he supported the deployment of AU troops to fight Boko Haram, which is increasing its attacks in the runup to the general election on 14 February. Thousands of people have been killed in the five-year-long insurgency. Iran also said on Saturday it has begun consultations with west African countries affected by Boko Haram to provide help. Its deputy foreign minister, Hossein Amir Abdollahian said he was confident the Islamist insurgent group could be defeated with collective action. “We will share our experiences in combating terrorism to defeat Boko Haram. We will achieve that without a doubt,” the official said on the sidelines of the AU summit. On Friday the US promised more technical support, training and equipment. African nations have opened up a new international front in the war on terror. Chad said on Saturday its forces had killed 120 Boko Haram fighters in the north of neighbouring Cameroon in a battle that began when the insurgents attacked its troops. Boko Haram has recently launched cross-border attacks from Nigeria into Cameroon and Chad as part of its drive for an Islamist state in the north-east of Nigeria. Chad and Cameroon have stepped up troop deployments to fight the militants. On Thursday, Chad sent a warplane and troops that drove the extremists out of a north-eastern Nigeria border town, the first such act by foreign troops on Nigerian soil. Chad’s victory, and the need for foreign troops, is an embarrassment to Nigeria’s once-mighty military. The foreign intervention comes just two weeks before hotly contested national elections in which the president, Goodluck Jonathan, is seeking a second term. Boko Haram provoked international outrage in April when it kidnapped 276 schoolgirls at a boarding school in the remote town of Chibok. Dozens escaped on their own, but 219 remain missing. Suicide bombings in recent months by young girls has raised fears that Boko Haram is using the kidnap victims in its conflict, which has displaced more than 1 million people and killed about 10,000 in the last year, according to the Council on Foreign Relations.